With Will Rogers’s untimely death in 1935, debate began quickly on how to honor America’s “Cowboy Philosopher.” Discussion on the location of where to build a monument was at the top of the list. With the help of Betty Rogers, the Oklahoma Legislature and thousands of individual donors, the Will Rogers Memorial in Claremore, Oklahoma, opened to the public on November 4, 1938. 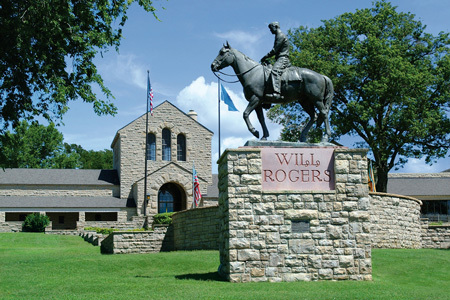 The beautiful limestone facility houses the largest collection of Will Rogers memorabilia in the world and all of his writings. The Museum has twelve galleries, a children’s museum, theater, and library. The grounds also have a lovely sunken garden where Will Rogers, his wife Betty, and several family members are entombed. June 28, 7 p.m.–8:30 p.m. The curtains literally are coming down in the Will Rogers Memorial Museum Theatre in preparation for renovation of the stage and remodeling of the auditorium. All new seating and an organ also will be added to the theatre. The theatre was added to the museum in 1982 and has changed little since it was built. It is used almost daily for school groups, tours, community events, and movie showings. Over the years the seating has become worn and faded, and the technology in the theatre is in need of an upgrade. A red carpet fundraising event held in November has provided funds for the renovation, but sponsorships are still being accepted for theatre chairs. Seat sponsorships are $350 and can be purchased at www.willrogers.com/theatre-renovation. The Will Roger’s Birthplace Ranch is located in Oologah, Oklahoma. Visitors can see the home where Will Rogers was born and explore the grounds of this 400-acre living ranch.